新年快樂! 大家有好好地享受你的假期嗎? 為了感謝所有會員們對YTSA的支持, 我們將要在2011年獻上更多有趣又好玩的活動哦! 首先就是廣受好評的便當+電影日又要來囉! 這次除了美味的便當以外, 我們還為各位準備了台灣的經典電影, 給你好吃又好看! Happy New Year! Wish you all have fun during Christmas and new year holidays!! Thanks for supporting and participating YTSA last year, YTSA will bring you more exciting events and benefits in 2011!! 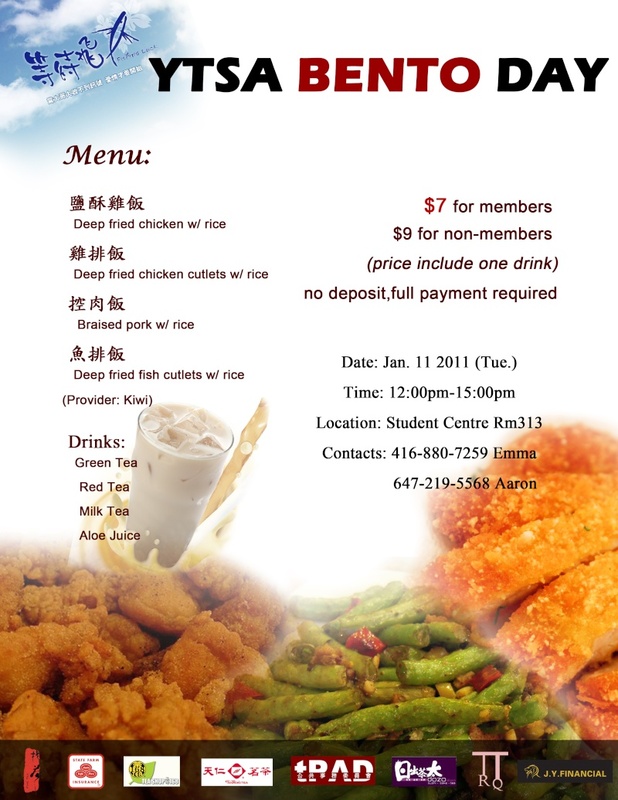 First, the monthly bento event is coming up again!! Please check the top left corner of this forum! Re: 【已結束】YTSA BENTO + MOVIE DAY!!! To Aaron: Good organizing skill, planning skill. To Arts: Good poster design! It looks delicious. Dont worry martin, its totally different from classic movies!! u can come get the bento and then go back to ur class..
Can I buy bento on Tuesday? Will it be more expensive? sorry there won't be bento selling on that day. Also, the deadline to order bento has passed.